Attractive adult man resting in a cafe and talks on the phone, taking notes in a diary, is a cup of coffee next to lay tablet on the table. 4k00:10Manager in a blue shirt sitting in cafe, talking on phone, taking notes on a pad. On the table is a cup of latte next to the diary is a tablet. 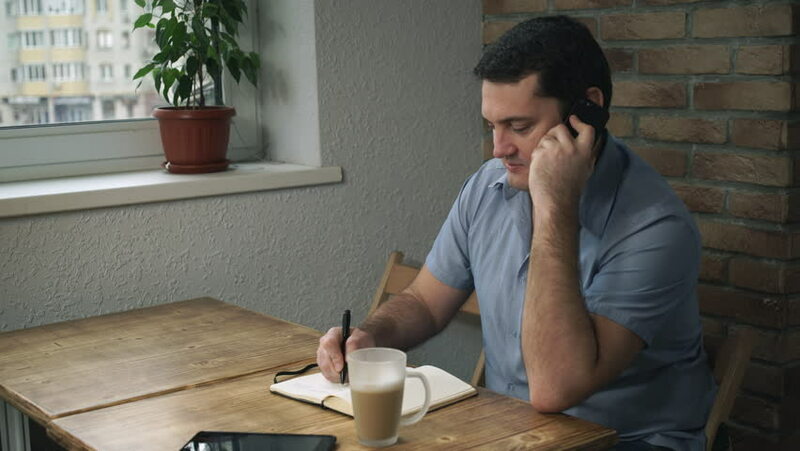 hd00:10Manager in a blue shirt sitting in cafe, talking on phone, taking notes on a pad. On the table is a cup of latte next to the diary is a tablet. 4k00:17Open space is a top view of a man, a man lying on the couch, talking on the phone, standing next to a coffee table. hd00:19Online shopping, attractive man lying on a soft chair to shop online with a credit card, top view, a plaid shirt and jeans. 4k00:17Man works in modern room. Young guy wearing in casual shirt. On the wooden table glass with orange juice. On the background business meeting with colleagues. 4k00:15Businessman working with documents and computer. Man holding financial paper with diagrams and charts. Open space room with windows orange chairs and tables. Guy wearing in casual shirt and jeans.